Russia's response to the US foray into Syria was in many ways typical of the ongoing exchange of accusations, denials and counter-accusations. But the reaction was as a whole, perhaps, a little muted, more understated than to be expected. Russia talks a good game led by a brash, unapologetic strongman but it is also a country in a deep economic quagmire, exacerbated by sanctions. And ultimately at the crunch, a country whose military budget is approximately one-ninth that of the States even before swinging cuts due this year. Facing up to the new reality of the opposite corner being equally brash, equally unpredictable but, frankly, packing a lot more heat, may have just caused the Kremlin to have a moment of retrospection. Vladimir Putin views the US missile strikes on Syria as “aggression against a sovereign state in violation of international law, and under a false pretext,” according to his spokesman, Dmitry Peskov. “With this step Washington has struck a significant blow to Russian-American relations, which were already in a sorry state,” said Peskov. 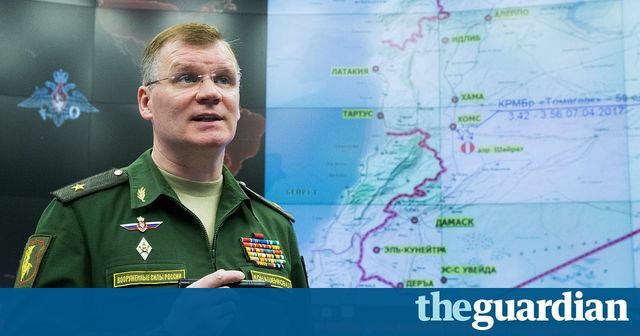 The Russian response to the missile strike was one of almost unanimous condemnation, though it is unclear how much appetite Moscow has for a real escalation with the US in Syria.